At Balanced Living Chiropractic Wellness it’s our goal to help make Buffalo and Western New York a healthier community… naturally. At Balanced Living Chiropractic Wellness, we listen, evaluate and educate. We face physical, chemical and emotional stresses every day of our lives. The quality of our lives is based upon how well we adapt, overcome or rise above them. At Balanced Living Chiropractic Wellness we listen, evaluate, analyze and then create an individualized spinal adjusting and care plan that specifically address these stresses based on your age, condition, lifestyle and unique health goals. We advise and recommend that we go through, rather than around. That we use natural, rather than artificial. That we revitalize, rather than numb and that we release, rather than control. This is our purpose and our service to Buffalo and Western New York! At Balanced Living Chiropractic Wellness our first and foremost focus is in educating our Amherst area patients and future doctors of chiropractic. That is why we have been working with University of Buffalo’s School of Public Health and Health Professions in the area of Exercise Science by accepting student candidates for a pre-chiropractic internship. From time to time we may ask patients and clients if one of our educated interns can observe an office visit. The University of Buffalo’s Exercise Science Department has a sound knowledge base in the scientific principles that underlie human movement, and requires the develop of basic skills in: exercise assessment and programming in health and special populations, performance enhancement, prevention and treatment of sports injuries, nutritional principles applied to exercise and sport, patient/client interpersonal relations professional ethics and behavior. In recent years, the public has recognized that adopting a lifestyle combining regular physical activity with good nutrition reduces the risk of death or debilitation from cardiovascular disease, cancer, obesity, and diabetes. As a result, employment opportunities in exercise science and related health fields have increased dramatically. 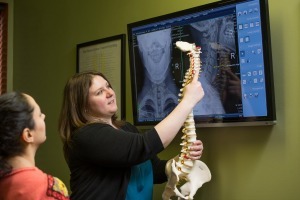 Approximately 50% of our graduates enter other health related professional programs in chiropractic, physician assistant, medicine, and physical therapy or enter graduate school. The other 50% of grads enter the exercise science field directly in areas such as: cardiopulmonary rehabilitation, strength and conditioning, corporate fitness, sports medicine, community health and wellness, and personal training.